Mrs G H Parker was Tryphena Lousada #80, eldest daughter of Edward Charles Lousada, and sister of Aubrey George Lousada. 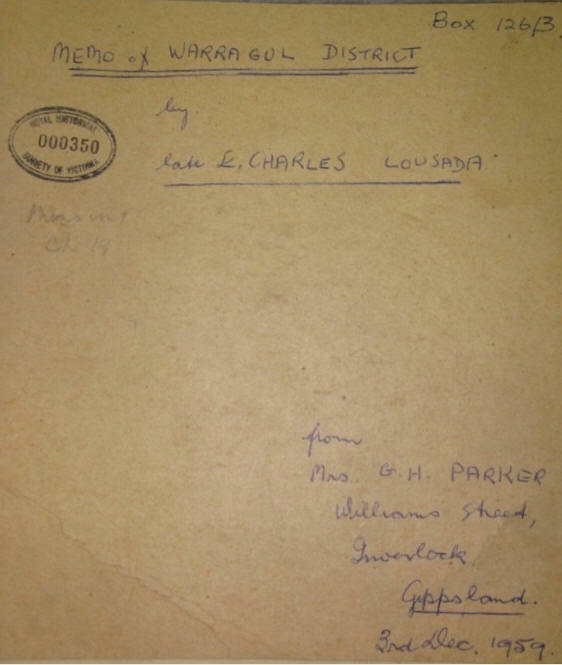 The recollections of Edward Charles Lousada have been transcribed by the West Gippsland Genealogical Society and the transcript can be found on the shelves of the Society's library in Warragul. 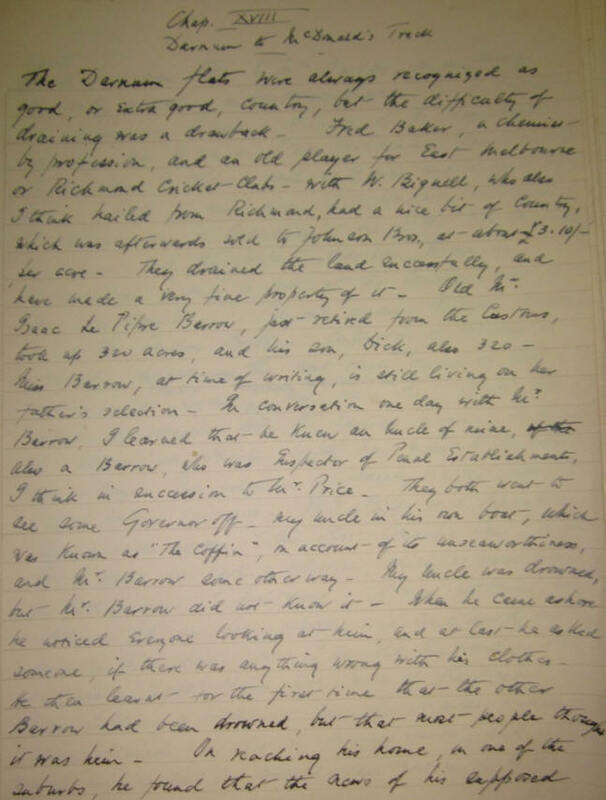 An extract is shown on the right - this shows that Edward Charles was aware of his Australian Barrow connection of the previous generation. Kathie Olden, grand-daughter of Tryphena Parker nee Lousada is custodian of some family documents - in front of her is a 1876 diary of Edward Charles Lousada recording daily life as a pioneer Warragul farmer, including close working with his Barrow cousin Herbert de Symons Skipper. Kathie is Baw Baw Principal Librarian of the West Gippsland Regional Library Corporation in Warragul. 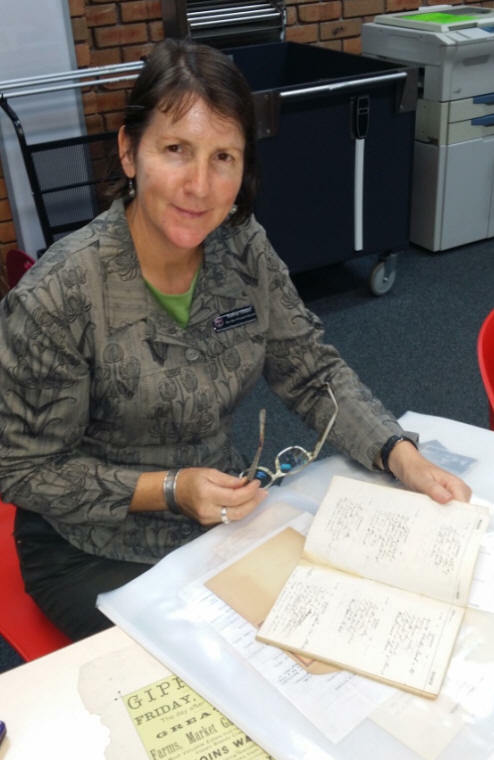 On the occasion pictured above in Apr 2015 she convened a meeting on WW1 memorabilia, at which she displayed inter alia letters from our 2 lost great-uncles, 2 of which - from Cecil - have been uploaded. She also displayed a 1887 poster from William Hamilton & Co - the firm in which Edward Charles first worked in the stock & station business. Kathie's parents are Lindsay Olden and Elvie Olden nee Parker of Inverloch, who regularly dine with prominent local historian Neil Everitt (as Neil told Julian Land at Toora on 26 Aug 2017). Kathie noted that her Olden ancestors have an interesting (Luddite) history of their own. This recollection of the drowning of Samuel Barrow refers to Isaac le Pipre Barrow who was on the water on the same day as Samuel Barrow drowned. They were unrelated - the latter being of Huguenot descent. Edward Charles did not know the name of the Governor being farewelled in 1854 on Port Phillip Bay - it was Governor Latrobe to whom Samuel Barrow owed his job as Superintendent of Prisons - preceding not succeeding John Price.